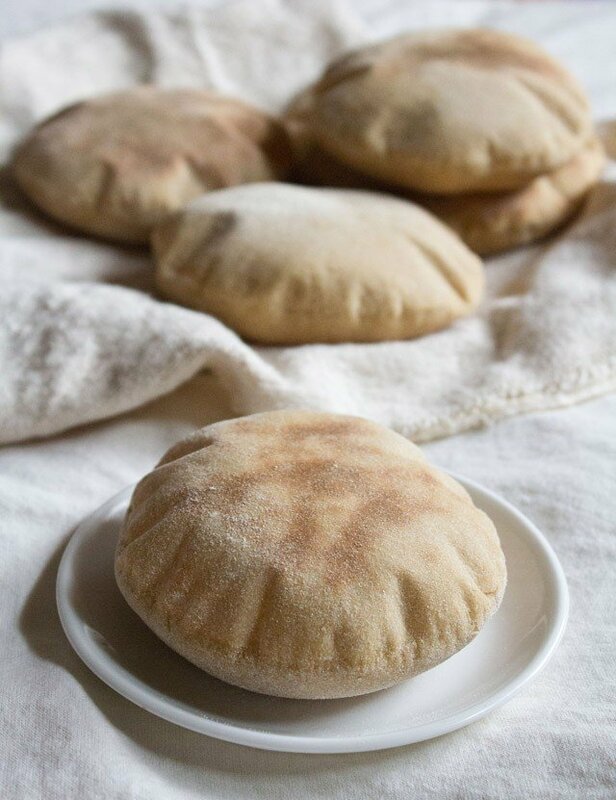 the best whole wheat pita bread recipe with oven as well as baking method. 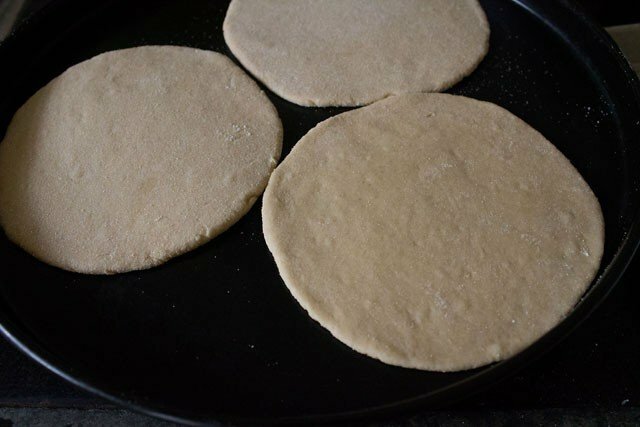 pita bread recipe with step by step photos – this pita bread made from whole wheat flour, is soft, moist, light and has their trademark pockets. i was exposed to falafels and pita bread in my childhood and from then onwards, i have always liked them. 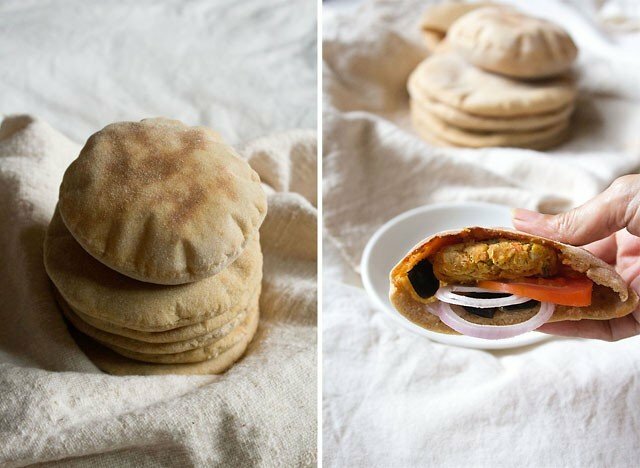 pita bread stuffed with tahini, hummus, falafel and raw veggies is a snack i look forward to. whether its made by me or by someone else or in a lebanese restaurant. does not matter. generally i make them a little extra and store, so that i can have them for a couple of days more. the extra pita bread can cut into wedges and then baked till crisp, later to had with dips. they are also the easiest bread to make. 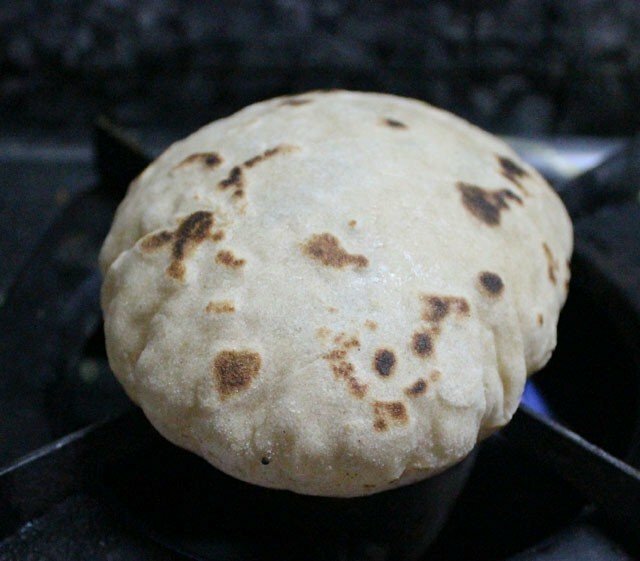 the first time i had made pita bread, was on the stove top and i was so thrilled seeing the bread puffing up like phulkas. you will see in the pics below. the recipe of pita bread is adapted from one of my favorite bread book “the bread bible: 300 favorite recipes” by beth hensperger. i can tell you that this is the best recipe for making pita bread. 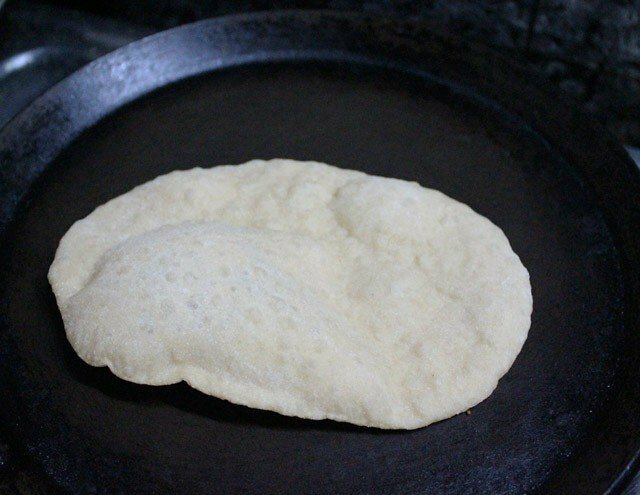 when you make the pita bread on a tava or frying pan, they will get brown or black spots. but when you bake them you won’t get any spots. i browned them a little more in the oven as i like my bread to be a little extra browned and baked well. once you have lots of pita with you, then give wings to your creativity and come up with different sandwich combinations and fillings. you can even stuff with potato sabzi or chana masala with some onion rings, tomato slices and some mint chutney + tamarind chutney. 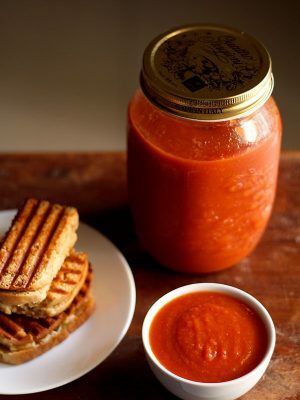 or make some veg kebab or veg cutlet and add our usual chutneys and serve in so many ways. in a small bowl add 1/2 cup of the warm water. sprinkle a pinch of sugar. then and the yeast and stir. keep aside for 10 to 15 minutes at room temperature. 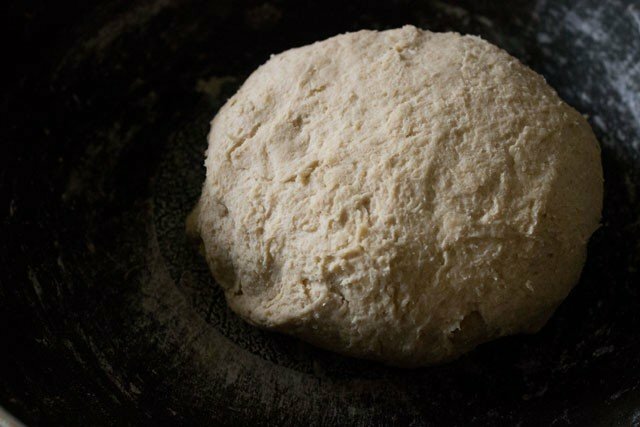 after the yeast has frothed, add the yeast mixture and knead into a soft, smooth dough. 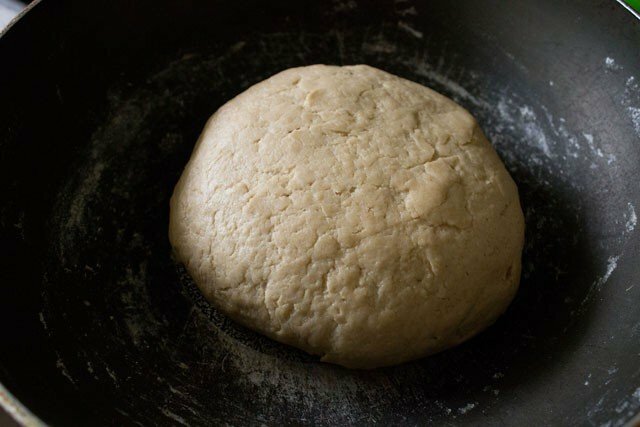 place the dough into a greased container or in the same bowl with some olive oil applied all over the dough. 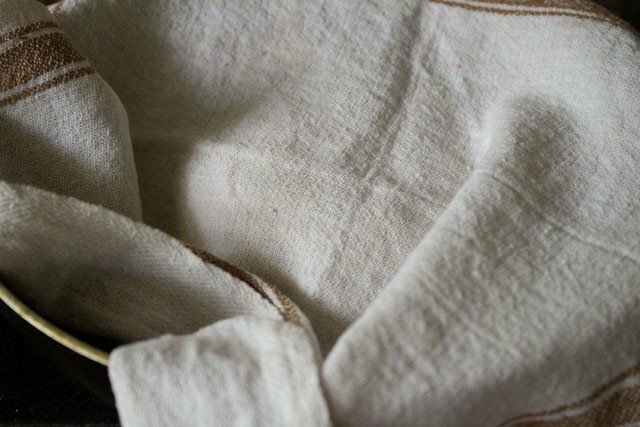 cover with a kitchen napkin and keep at room temperature for for 1 to 1.5 hours. once the dough has doubled up, then remove the dough from the bowl. dust the working surface with flour and roll each ball into round circles of about 6 inch about 1/4 inch thick. cover the circles with the kitchen towel loosely and let them rest at room temperature for 10 minutes. now place them on a greased tray and bake at 200 degrees Celsius (the 200 degrees celsius is for baking in a convection mode of a microwave oven. 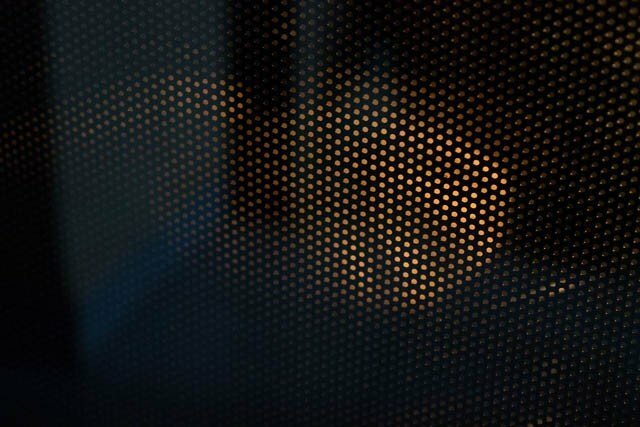 if using a regular oven, then preheat as well as bake for 250 degrees Celsius/482 Fahrenheit) for 7 to 10 minutes or till puffed up and light brown. 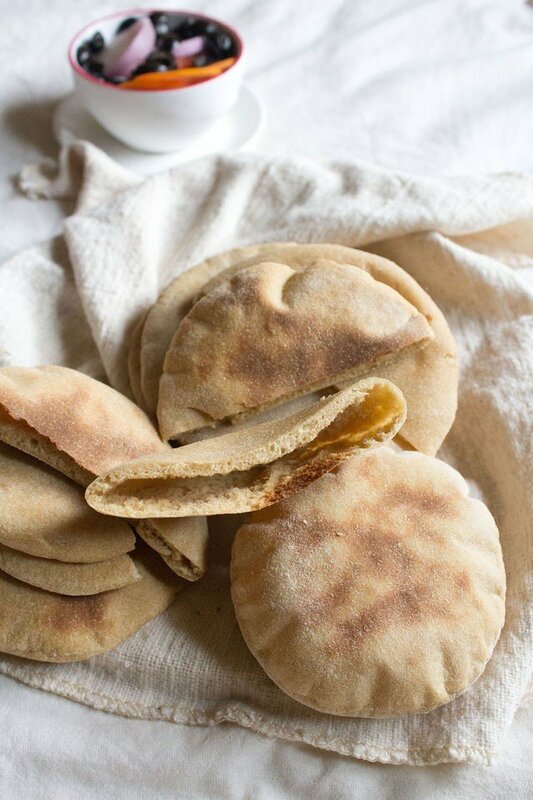 bake all the pita bread this way. heat a non stick frying pan or tava. place the bread on the tava and cover for 2-3 minutes till the bread starts puffing up. flip the bread the other side and cook for more 2 to 3 minutes. stack the pita bread and store them in a kitchen towel or bread box. you can also serve pita bread warm. just slice the pita bread into two. you will see the pockets. stuff the pockets with a filling of your choice and your pita sandwich is ready. if the dough becomes too sticky then add some more flour. remember to proof the yeast in warm water. less warm water or hot water will not yield good results. you can also knead the dough in a mixer fitted with a paddle attachment. 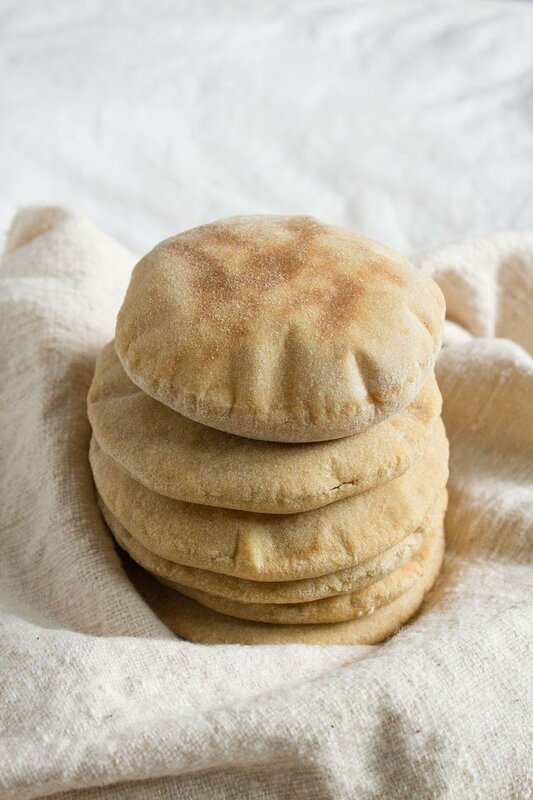 you can double as well as triple this pita bread recipe. like all my bakes, i have baked the pita bread in a microwave oven in the convection/baking mode. 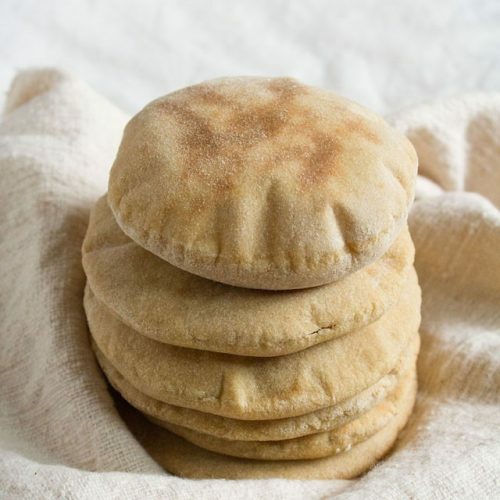 since the recipe is lightly adapted, the pita bread should fluff well in a regular oven too if the yeast proofing and leavening of the bread is done well. 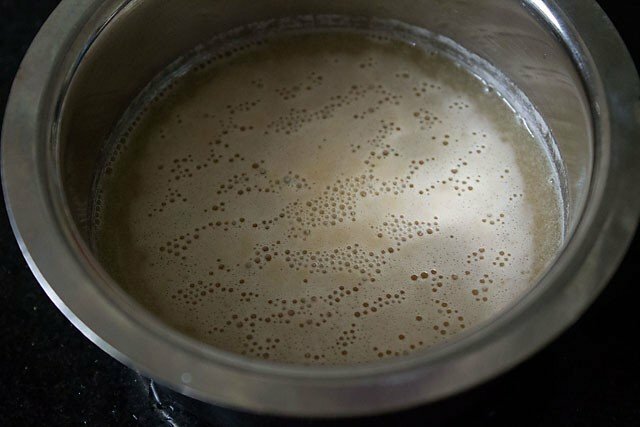 1: firstly proof the yeast by sprinkling a pinch of sugar in warm water & then adding dry active yeast to it. stir and keep aside for 10 to 15 minutes. 2: in a bowl or pan, add the flour, salt & olive oil. 3: now add warm water. 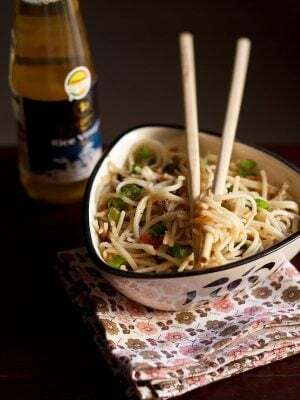 4: just mix everything with a wooden spoon. 5: the yeast mixture has frothed now. 6: so add the frothy yeast to the wheat flour mixture. 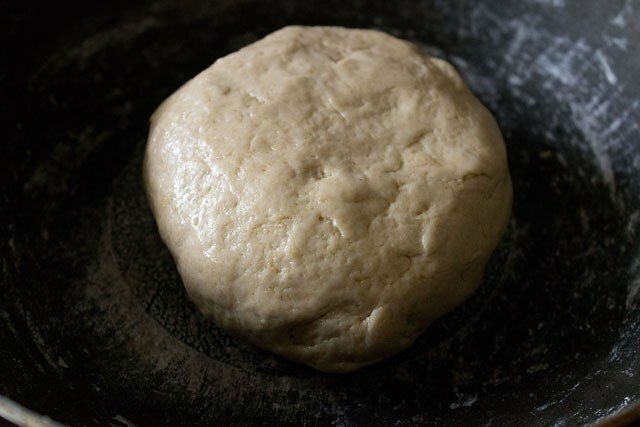 7: knead into a smooth and soft dough. if the dough is a little sticky & moist than no issues. after keeping it for leavening it becomes alright as you will see below in the 9th pic. the dough has to be moist and soft as well as smooth too. 8: apply some olive oil all around over the dough. 9: keep it in the same bowl covered loosely with a kitchen towel for 1 to 1:30 hours or till the dough has risen. 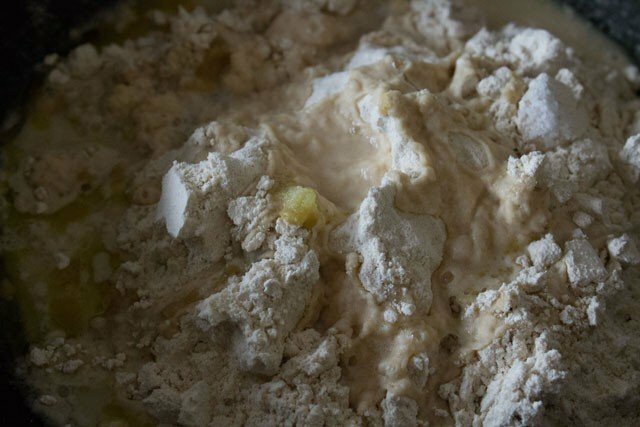 10: this is how the dough looks after 1 hour & 5o minutes…. i kept for a longer time as it was raining heavily this day and the temperature was on the cooler side. see the cracks in spite of it being a little extra moist & sticky dough. 11: deflate the dough gently and if you want then knead lightly. 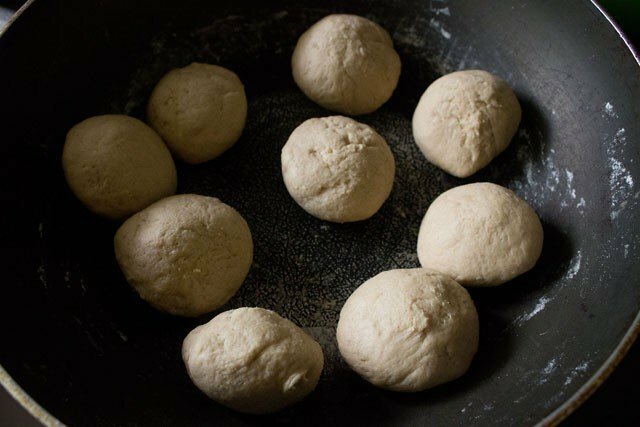 12: now make medium sized balls from the dough. keep these covered again for 10 minutes. 13: dust some flour and roll each ball into a flat poori shape or rounds exactly the way you make pooris. you can also make them oval shaped if you want. keep the bread a little thick than you would keep for pooris. keep these rounds covered loosely for 10 minutes more. 1: place the rolled bread on a greased baking tray. 2: bake in a preheated oven for 200 degrees C for 7-10 minutes. mine took 7 minutes to cook and 1 minute to brown. please note the 200 degrees celsius is for baking in a convection mode of a microwave oven. if using a regular oven, then preheat as well as bake for 250 degrees celsius/482 fahrenheit. the baking time may vary from oven to oven. 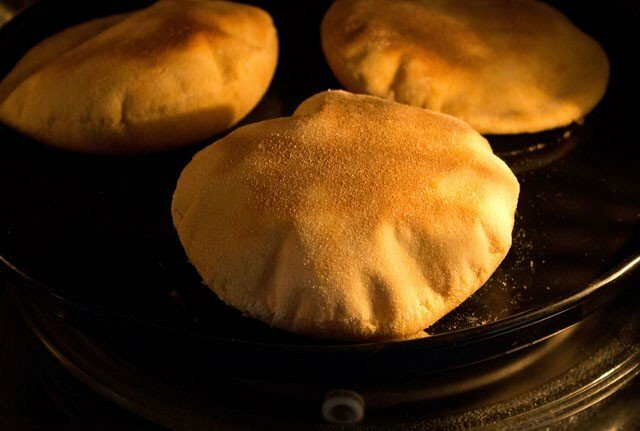 3: look at those puffed up pita bread… don’t they look good? 1: heat a tava or a non stick frying pan. place the bread on the hot tava and cover it with a lid for 2-3 minutes. 2: the bread will begin to puff up. 3: turn over and cook for 2 to 3 minutes more till the pita bread is done and has brown spots appearing on both sides. 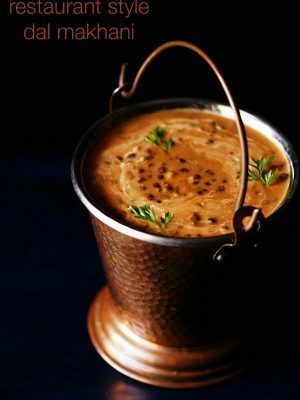 4: alternatively, you could also make them the way we make phulka (chapati). after lightly cooking both the sides, place them on the fire and see them puff… cook both sides. 5: stack pita bread and store them in a kitchen towel or bread box. you can also serve pita bread warm. just slice the pita bread into two. you will see the pockets. stuff the pockets with a filling of your choice and your pita sandwich is ready. i added falafel, roasted red bell pepper hummus with some veggies and olives to the pita. you can also serve with plain hummus too. sorry please ignore the msg i just sent.. i just saw ur reply.. i am soooo sorry..
yes you can add milk. 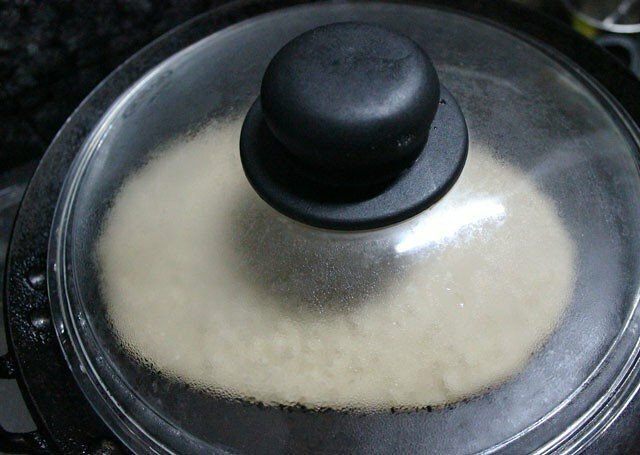 you can use the same amount of milk as that of water – 1.25. but depending on the quality of flour you may need to add more or less milk. when i get time i will add the recipe or include the proportions of other grain flours in this recipe itself. Thank you for all the efforts you put into making these easy step by step practical recipes with perfect ingredients. 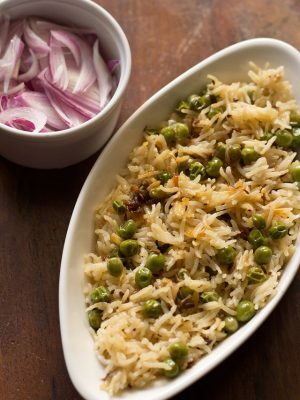 I have tried alot of your recipes and they have ALL come out perfect and delicious.. only thanx to you I have got the confidence to try out new dishes without any doubt. Next I wish to try this pita bread rcp. 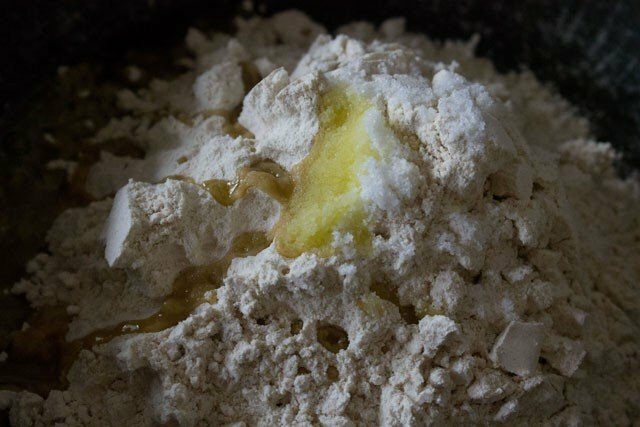 but have a couple of questions..
1. i don’t have dry active yeast, i generally use instant yeast and add it directly to the flour so is it possible to use Instant yeast instead. 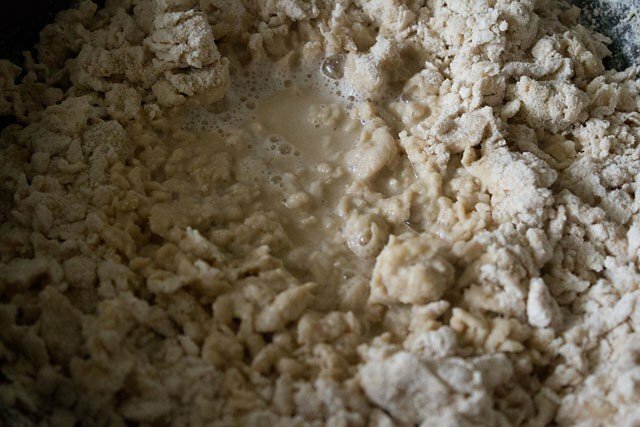 does the quantity of yeast change? 2. to knead the dough you have suggested 1.25 cups of warm water. I was wondering can it be a combination of warm water and milk? will addition of milk make the dough soft and moist? and will make any difference in the taste? Lastly, my sister has celiac and she is on a 100% gluten free diet so i was wondering, can this recipe be used with different vrat flours/ gluten free flour. thank you natasha for these lovely words. 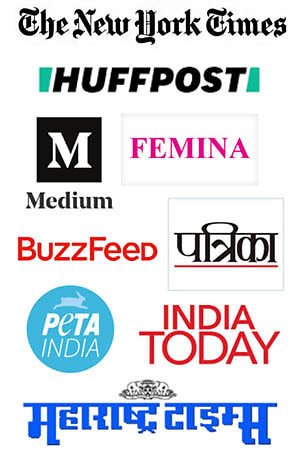 glad to read them. 1. for the pita bread you can use instant yeast. add 1 teaspoon intant yeast. 2. yes, of course, you can use a combo of warm water and milk. addition will milk will make the pita bread slightly rich and soft. yes there will be a difference in the taste. 3. with vrat flours or gluten free flours you can make. but then you don’t need to add yeast. some experimentation will be required. the gluten free flours have to be kneaded with hot water. this will make the texture soft and the dough is easy to roll. thanks again natasha and wish you all the best. Thanks for the suggestion, Dassana! 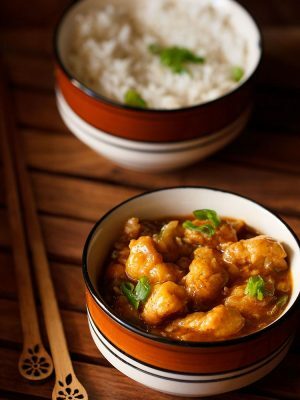 Your site is my go-to site for everything cooking! Cannot think of another site which can easily put things together with the help of a detailed description and images of various stages of the process. Kudos to the great work! I would like to check if you have experimented with Quinoa Pita bread, ever? The idea crossed my mind this morning and i am lost with the measurements. I am going to experiment with your wheat flour measurements and see how it folds out. I’d be ever so grateful to get your expertise on this. thank you much lalita for this lovely comment. i have not experimented much with quinoa. 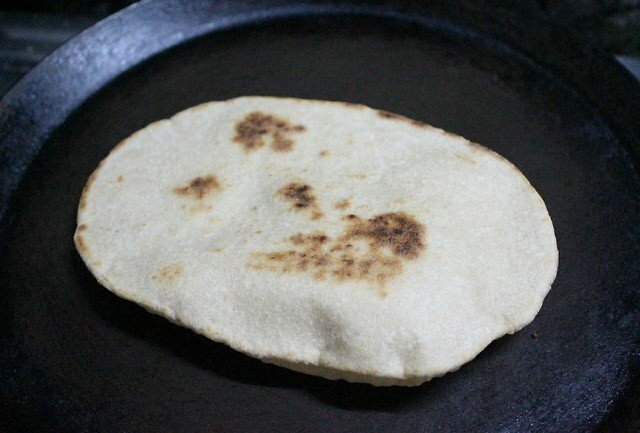 you can easily make a pita bread with it. 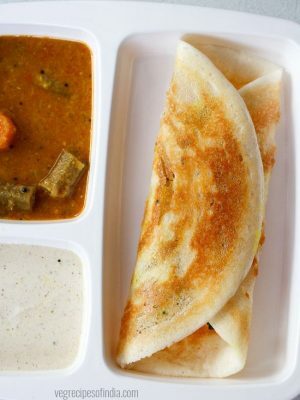 i have worked with other flours like buckhweat, amaranth, finger millet, rice etc in making indian flat breads. so definitely quinoa flour can also be used to make breads. you can add 1:2 ratio of quinoa flour to whole wheat flour. its safe for experimentation as the amount of whole wheat flour is more. the quantity of water may be less or more. 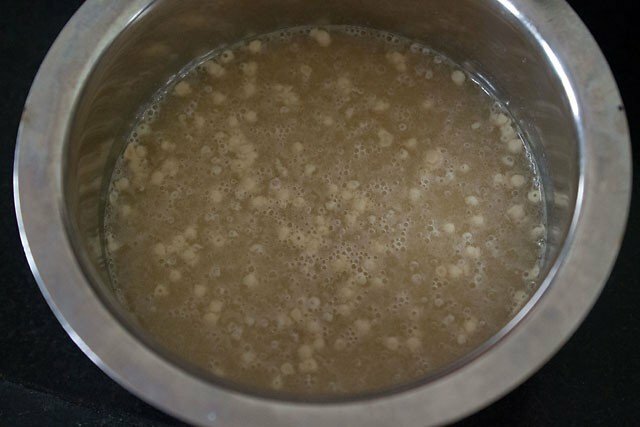 so just dissolve yeast in one-fourth cup warm lukewater first. 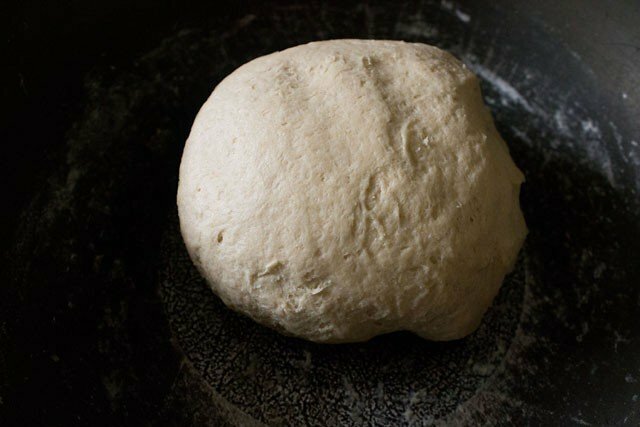 then you can add lukewarm water or water at room temperature as needed to make a soft dough. hope this helps. Thank you for a good bread recipe which I have precisely followed and been using for about two weeks. It is the only recipe which worked for me so far especially the first time when all the 6 loaves I made puffed. However, subsequent bakings have not been successful as far as puffing is concerned. In the same baking session some loaves puff while others don’t. And sometimes, some areas of the same loave puff while the rest don’t. What could be the reason? I still have problems with the flattening process which I am unable to get right. I don’t see “wholewheat” flour here in Sydney. The available one is called Wholemeal. Are they one and the same thing? The taste is ok but what can be added to get a better taste? 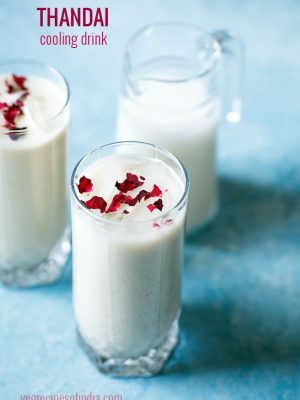 I have seen recipes using yogurt. Will that improved the taste? Will it affect other the puffing and softness? The bread comes out generally soft but the crust is a bit stiff, a biscuit like feeling. I am not sure why but I am guessing that the reason could be due to the fan in our wall mounted oven. This oven does not have the capability to run without the fan. By the way, how much is a pinch of sugar? I have been using 1/2 tsp. One more thing about olive oil. Can it be dispensed with? What is the effect of not using it? Could it Be the cause of that stiffness or the biscuit like feeling I mentioned earlier? thank you Mahmoud. 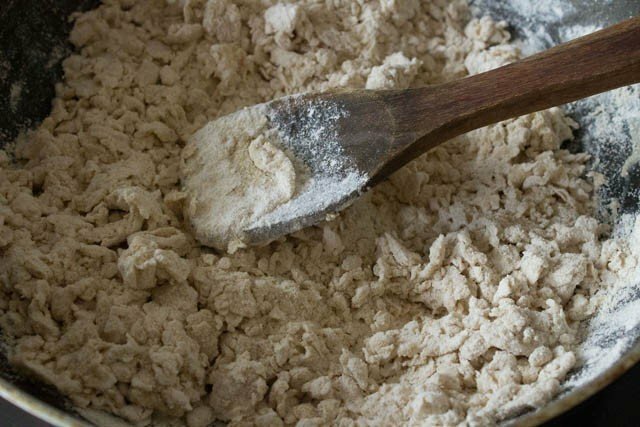 wholemeal flour and whole wheat flour are one and the same. 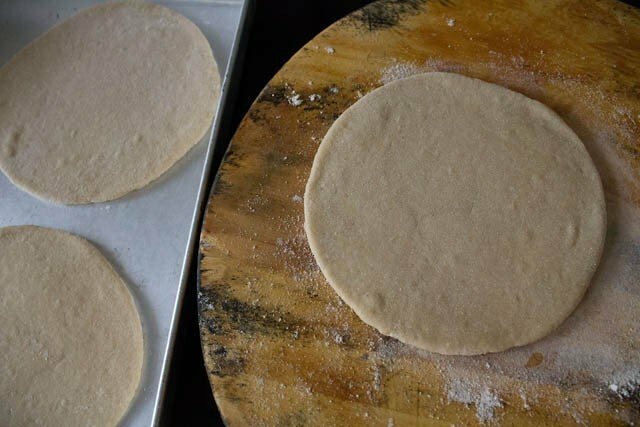 the pita breads not puffing up can be due to less water content in the bread or they are not rolled evenly. if these two things are taken care of, then the pita bread will puff up. you can add some yogurt in the dough and it will help in making the bread soft as well as give it a faint sour taste. your guess about the crust is right. its due to the top getting a bit overdone and the fan is responsible for it. in convection ovens which have a fan, the baking is faster as the fan accelerates the baking process. so you can cut down the time by 10 to 15 minutes or reduce the temperature by 15 to 20 degrees celsius for any recipe. you can skip olive oil. it just gives a nice flavour but can be skipped. olive oil is not the cause of the biscuit like crust.